There is something about trains that I really love. Can't really put my finger on it but whenever I see a train, I want to photograph it and ride on it. I've been on some memorable train rides including the Rocky Mountaineer that goes from Vancouver, British Columbia to either Banff or Jasper, Alberta. One of my favorites is the train ride from Durango, Colorado to Silverton, Colorado. The train is a narrow gauge, which is better suited to navigate the sharp curves of the mountain terrain. It was used to haul silver and gold ore from the Silverton area as well as supplies and workers. 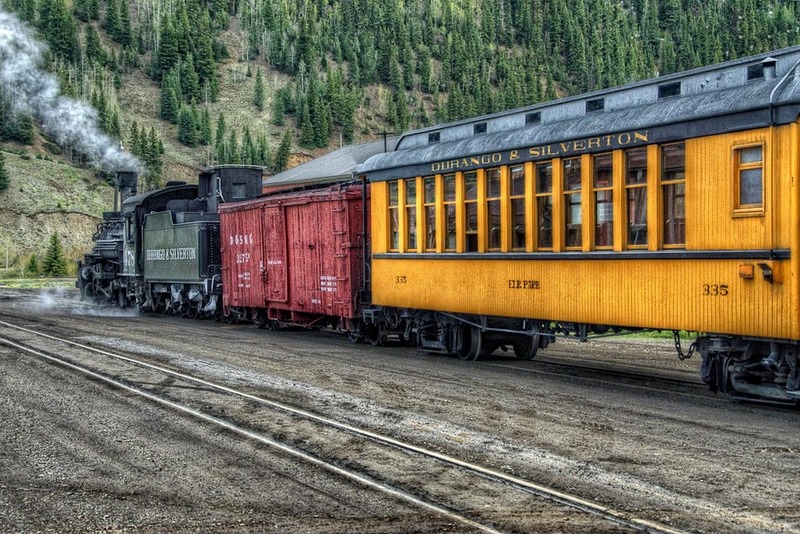 Today, the Durango and Silverton Narrow Gauge Railroad is used as a tourist attraction. The train leaves Durango for a 3.5 hour, 45 mile trip trip through the rugged San Juan Mountains. The scenery along the way is outstanding. It arrives in the town of Silverton for a two hour layover. Silverton is a small old-time mining town which has been designated as a National Historic District. This shot was taken as the train was readying to head back to Durango. It is a HDR from a single photo. Click for information about the train's history and schedule.